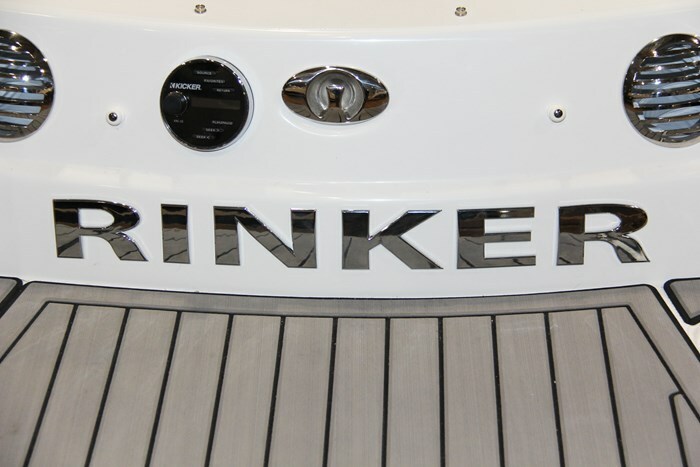 The 20MTX and 22MTX are unique in Rinker’s lineup of twenty-four models of both outboard and sterndrive powered runabouts, sport and surf boats, cuddy cabins and cruisers from seventeen to thirty-seven feet. These two bowrider models are unique in that the “MTX” designation refers to the pickle fork design of the bow which allows more seating/elbow room and therefore greater comfort up front. This bow area is a generous U-shaped with surrounding seating except for the windshield walk-thru section and is complimented with full surrounding upholstered and padded back bolsters. 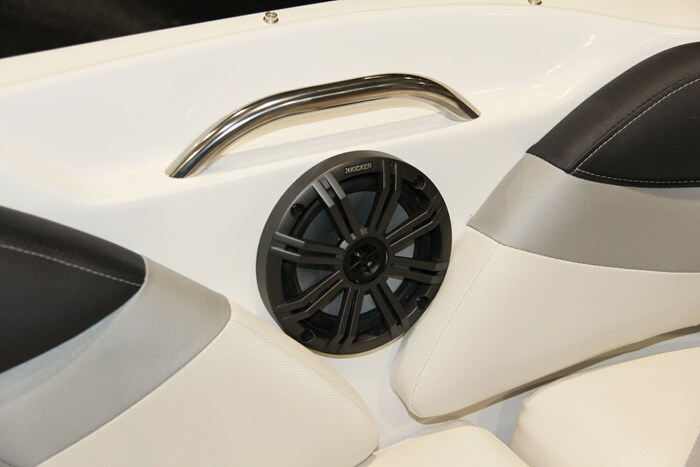 A break in the bolsters in one small area on each side accommodates a stereo speaker which is fully protected by the bolstering plus a recessed stainless steel grab handle. 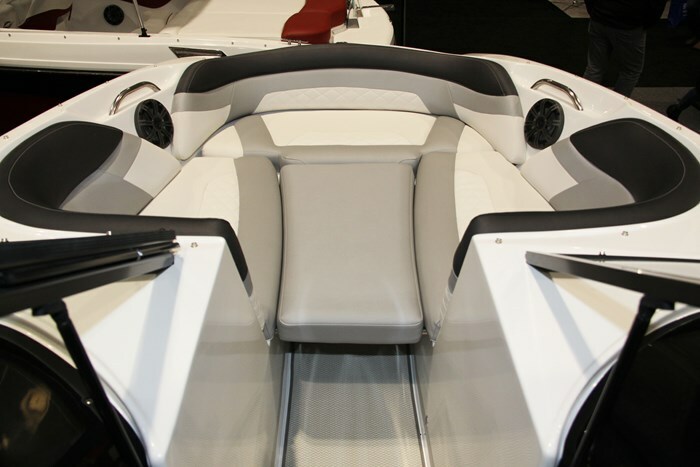 Two stainless cupholders are provided in this bow area plus storage beneath the seat cushions with dedicated storage for an anchor. A pair of high back adjustable and swivel bucket seats, both with flip-up forward bolsters for driver and passenger face their respective helms. One thoughtful and unique option is that both of these molded helms may be upgraded to match your choice of hull side colour. The passenger helm features a glove box and the attractive driver’s helm with molded eyebrow comes standard with tilt steering and three large diameter gauges; tachometer, speedometer and a multi-function center gauge for fuel, temperature, oil pressure and trim. A curved stern bench seat with storage beneath the cushions provides the balance of cockpit seating. 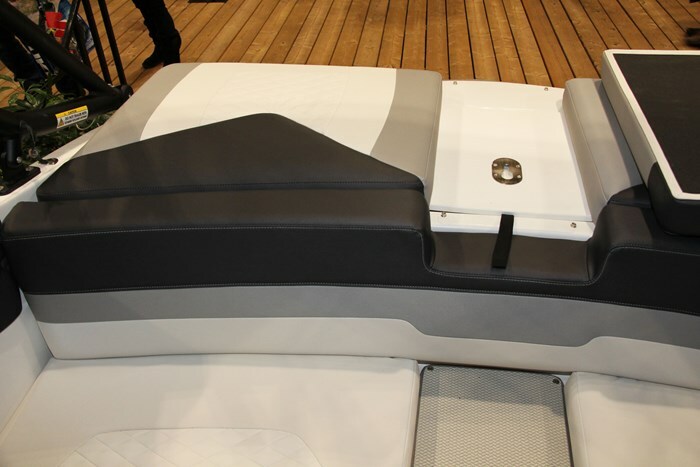 The center cushion of this stern seat is removable to provide a step up to the full-width sunpad center transom walk across to the swim platform by removing the center cushion of the sunpad. 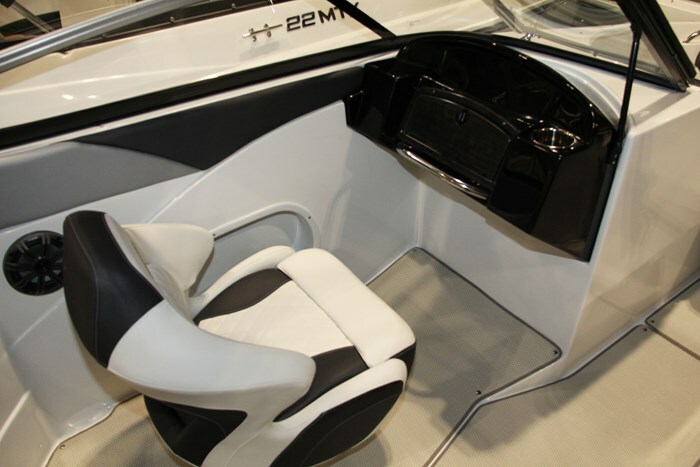 A cockpit in-floor storage compartment located between the two helm seats is ideal for watersports accessories such as waterskis or wakeboards, tube, etc. 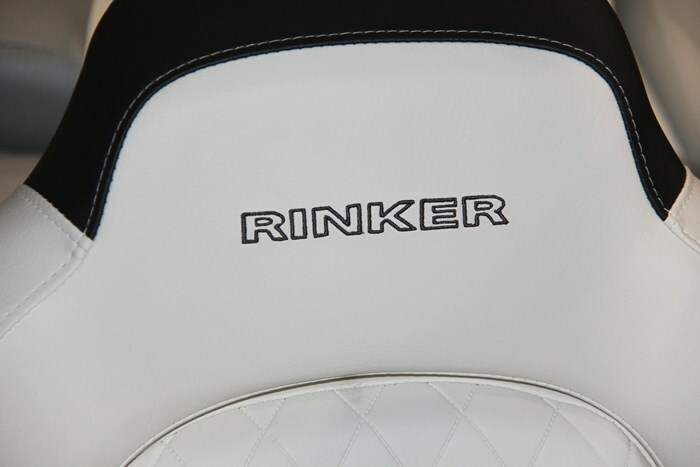 Cockpit upholstery vinyl is available in your choice of Marquee White or Sand Castle. Snap-in cockpit flooring of Chilewich Bamboo comes in Chalk or Oat colour – your choice. This may be upgraded to Marine Mat in Gray or Tan for the cockpit and upper swim platform and/or for the lower extended swim platform. In addition, there are nine hull colours from which to choose and/or eight hull bottom colours plus nine colours of bootstripe colours which uniquely include this colour choice for the lower extended platform. You may also choose black or white for the rub rail which includes a stainless steel insert. 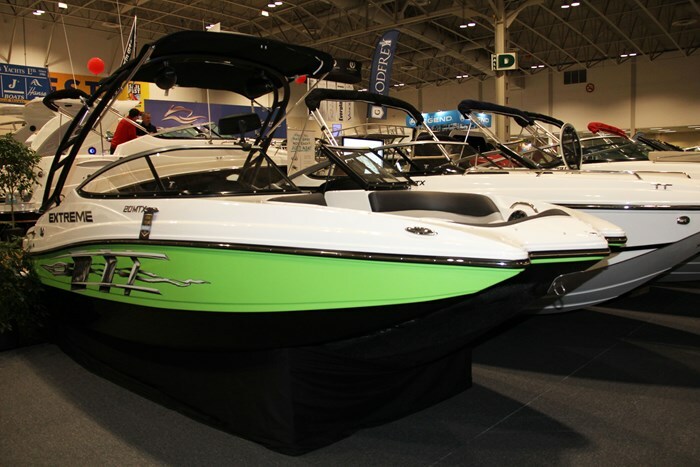 With all of these colour choices, there will likely never be two identical 20MTX boats on the same body of water. 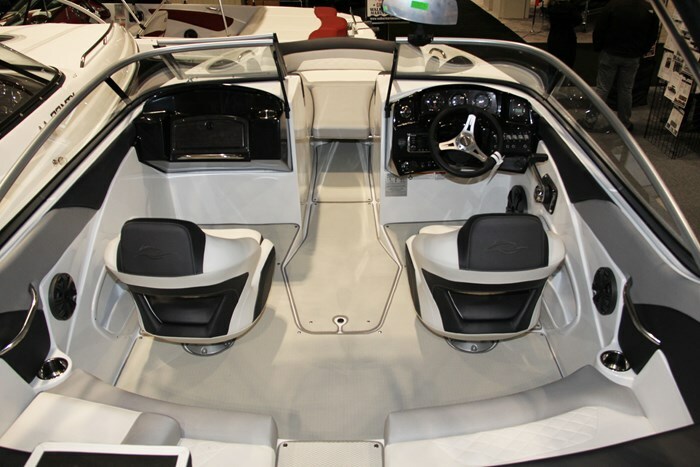 An integral molded upper swim platform provides a handy step up for access across the transom to the cockpit or down to, or a seating area for, the standard lower and larger extended swim platform with its concealed telescoping boarding ladder. A stainless waterski towing eye is provided on the transom. Also standard on the 20MTX is a portable carry-on cooler and a Kicker KMC 10 AM/FM Bluetooth compatible stereo with a weather band. Three very desirable optional upgrade packages are available. 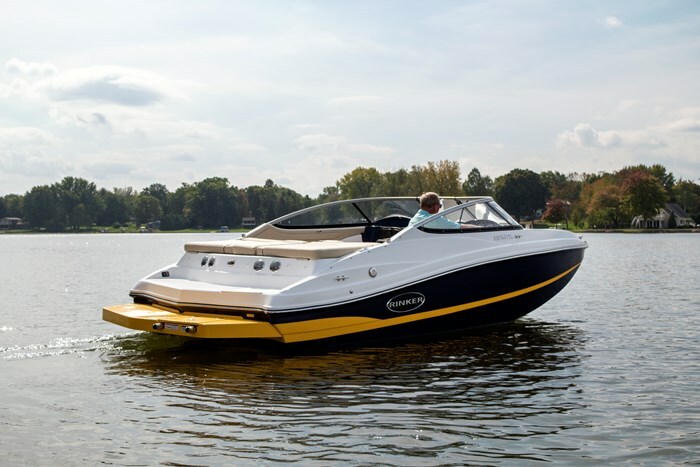 The first, the Captain’s Choice Package, includes your choice of engine upgrades to a MerCruiser 250 horsepower with Bravo 3 outdrive or a Volvo 280 horsepower with DuoProp outdrive plus a pair of LED swim lights, two or three-tone sport stripe hull colours, pull-up cleats, fender clips, and a cockpit cover. 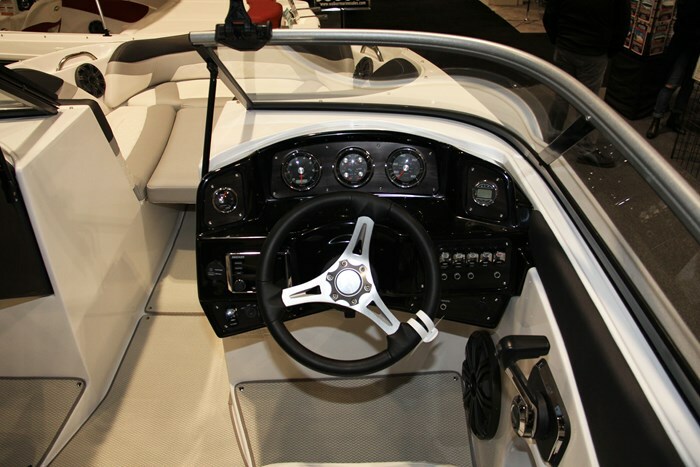 The second is the MTX Extreme Package which includes a custom folding tower with bimini top, mirror, and tower speakers, a black dash with upgraded instruments and switches, stereo upgrade with transom remote, bow scuff plate, dual batteries, swim light, and Custom Extreme gel scheme, graphics, and interior. The third package is the same as this second one but without the tower and its accessories. Engine choices include 200 or 250 horsepower MerCruiser 4.5L with an Alpha drive or 200, 240, or 280 horsepower Volvo V6 with an SX drive. 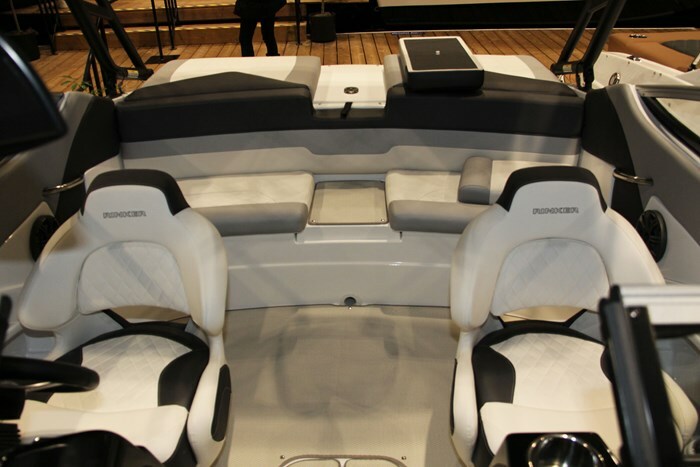 Other notable single options include a Kicker KMC 20 Sirius satellite-ready stereo with amplifier and subwoofer, lighted speakers, transom stereo remote, transom trim/tilt remote, the folding tower with bimini and with or without racks, automatic fire extinguishing system, dual batteries, digital depth gauge, LED swim light, bow scuff plate, pull-up cleats, fender clips, and LED docking lights. You will most probably want to add a colour-coordinated bimini top with boot, bow and cockpit cover, and/or full canvas enclosure. You have your choice of four canvas colours. Also available are bow filler cushions plus the Marine Mat flooring. 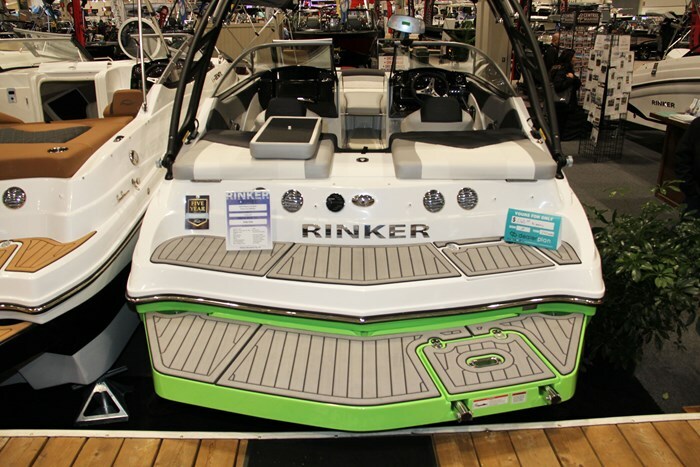 There are simply a multitude of choices to be made to outfit your Rinker 20MTX almost precisely the way you want it to be and to look in order to satisfy your desires for maximum on-water enjoyment.